The lady of Embracing a Wounded Soul honored me with this award. I had never heard of it before now, but I think I like it. 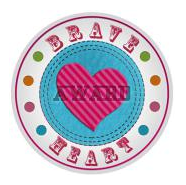 I don’t know if I would call myself brave but I do have a heart. So I’ll take half credit for it. The lady deserves it for sure. Tell us a little bit about your blog. Who designed it? The Theme is a free one from WordPress and I have put together the look and feel of it to match the place I was in at the time I began the blog. I’ve thought of changing it a little but each time something seems to make the look appropriate. I’ve done a bit of experimenting with the various aspects available to come up with something a little different here and there. What is the title and description of your blog? RonovanWrites. Author of MG/YA/NA/A Fiction through the eyes of a Lost Mind. Who is your intended audience? Whoever happens to wander through. I want to be a place people can come for a little variety, enjoyment, and understanding. How did you come up with the title of your blog? My name is Ronovan and I write . . . anything and everything. If people are wondering about the Lost Mind part, well, that has to do with amnesia. Give us an interesting fun fact about your blog. It will be 3 months old on July 17 and I put out at least 3 pieces of content each day. Why? I’m nuts. What other blogs do you own and what makes them alike? I have some in the thought process but not sure if I will actually do anything. I do have an actual website that isn’t hosted, why, money. It’s ronovan.com, very original, huh? Do you have any unique talents or hobbies? Talents? Hmm, I can teach little girls to drive golf carts. Actually I don’t know of any. Hobbies? I write. Unique ones? I love people. Actually maybe one talent is the ability to listen and just be open to actually listening to what others have to say and putting aside my own feelings in order to try and help them to get to where they need to be. What can we expect from you in the future? I need to, as they say down in my part of the country, hunker down . . . and get to work on revising my YA novel. I just this week started three Haiku Challenges and have Author, Cross Culture and Blogger Interviews on the way. But in truth, I want to get back to more of the writing, although I am learning a great deal about writing in everything I do. I have found the more you write, no matter the kind of writing, you learn, you learn your voice, and you learn your art. Oh, and I also have a second book in a romance novel trilogy that I was writing that I actually want to do possibly as a stand alone book instead. It’s a bit of a unique take on romance I think. I’ve found my writer’s voice now, I think I can do something more with it. Do you have any tips for readers or advice for other writers/bloggers? I like to say that tips from me are like chastity and relationship tips from the Kardashians, not worth much. But I suppose for writing . . . keep writing, read a lot, and not just books, but anything you can get your hands on. I read blogs of other writers and learn what does and does not work. For Bloggers . . . just don’t stop. Proofread what you put out, preview before you publish, take advice from other bloggers, engage with your those who comment on your articles and posts, and do not argue with an internet troll. Don’t feed the trolls. Also don’t be afraid to experiment with your blog early on. Also always be honest. A reader can smell a fake a mile away and won’t come back. To be honest I don’t know what constitutes a brave heart for this award. We all have them. We all live each day and don’t give up. Perhaps those who are willing to give of their hearts even when they know it won’t turn out well for themselves or perhaps follow their hearts when it won’t make loved ones happy. I suppose Kate of DazzlingWhimsy comes to mind as she raises her daughters by working so hard. I don’t know how she does it all, but she does. I’m not sure her girls even realize what all she does yet, but they will someday. Moms don’t come better than this one. I think Cielo of Ways of Life for loving as she does and showing fun on her website. A brave front and brave face to go with a bravery to follow her brave heart. I read her site and see these funny articles and all of her fascination with makeup and I know there is more behind it. She’s helped me understand there is a lot more to people sometimes than you think. She’s a good one folks. Just don’t tell her I said that. Hannah of Inked Roses comes to mind for bravery to throw herself out and into her writing in spite of her tendency to hold back. I want that brave heart to break a lot of walls down. I think the rules are to answer the above questions, post the award, link back to who gave it to you and nominate others. ← Wordless Wednesday Photography-Spunky’s sibling, Fluffy. Im blushing here, I am so honored! You are awesome, Ronovan! If anyone deserves this award it’s you. Thank you so much! You and your blog definitely deserve this award! Yeeeeaaaaaaa for you! Thank you! I am honored and flattered by the nomination. I live for my children and I appreciate your kind words.